Sorry for my long disappearance! I didn't mean to leave with no warning. We had a series of deaths in the family, then went on vacation to get away from things, then the holiday season began... Also, and this is so silly, but I *still* can't figure out how to get good pictures in my new place. I tried a new location that might work. I have been sewing a fair amount--especially right before my trip!--and hope to blog more regularly, at least once the holidays are over. Thank you to all who checked in on me; I really appreciate hearing from my sewing friends even when I appear to have dropped off the face of the earth! I miss everyone. And due to my long absence, I am way off schedule for the seasons. I made this during the pattern contest, which was in July. It's not getting much wear now! 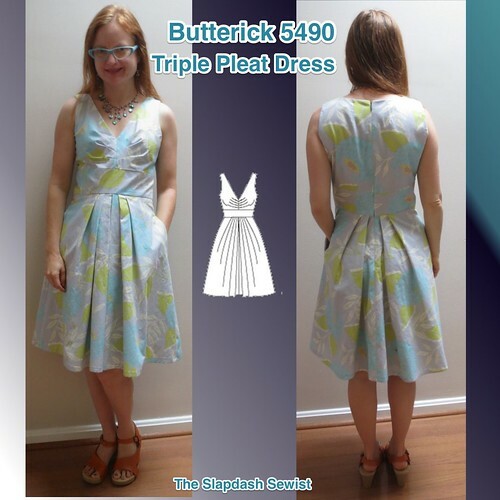 Butterick 5490 has been on my list for a while now. 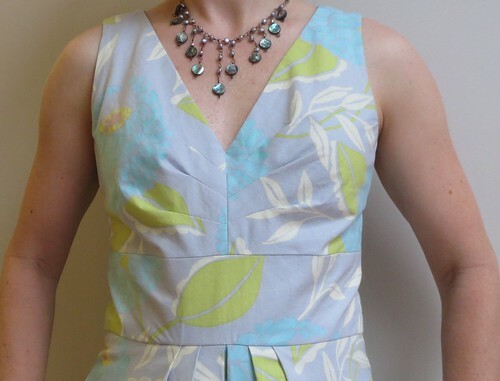 If you remember the Banana Republic Mad Men collection from a couple of years ago, the Betty Dress was quite similar in terms of the triple pleat in the bodice and the full, center pleated skirt (there's a front view here). I knew those triple pleats would pose a small bust problem even more than usual, as all the reviewers observed that the pattern would not be flattering to a small bust as drafted. I folded out width from each of the pleats, as well as shortening the neckline between the bust and the shoulder. 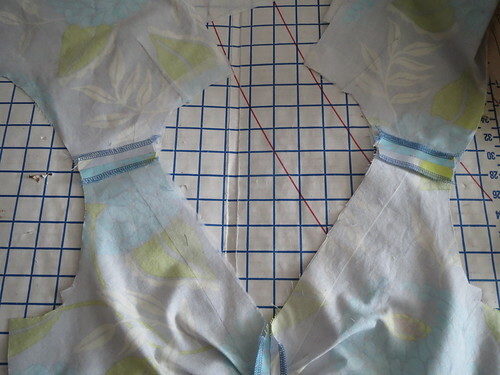 The pattern has a separate front bodice lining piece, a luxe touch I appreciate in these designer patterns (this one is a Suzi Chin/Maggy Boutique), and so the lining needed to be separately altered. 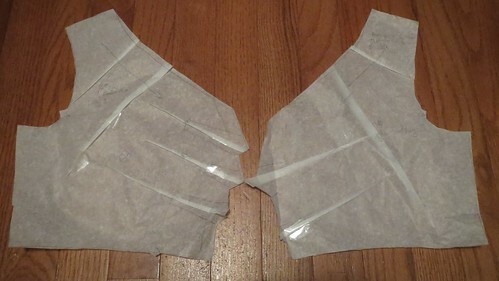 The triple-pleat fashion-fabric bodice is on the left, and the double-darted lining is on the right. Having worn the dress for a day, I realized I need to scoop some width out from the front armscye as it is digging into my arm. This is likely to do with my forward shoulders/bad posture. On the back, I did my usual broad back and swayback adjustments as well as my fairly standard addition of a dart in the back neckline to prevent gaping from my forward head/bad posture. This fabric was $1.99/yd from Fabric Mart, the special when I made the order. I love the huge print and the colors, especially the little touches of orange. I'm pretty sure it's a quilting cotton, though a good quality one. As such, it is only 45" wide and I couldn't cut the front skirt the full width it was intended. 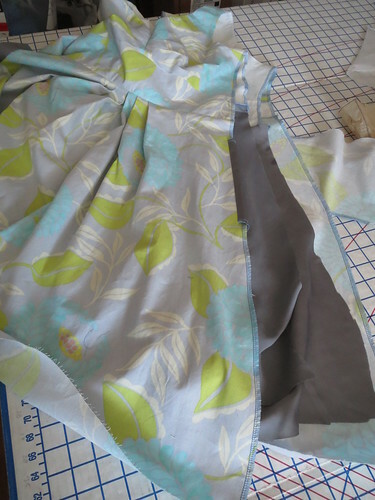 I cut the skirt as wide as I possibly could, but lost a pleat and about 10 inches of width. The skirt is still plenty wide! Having learned my lesson on past projects that ended up with stretched out necks, I interfaced the fashion fabric and the lining at the neckline and armscyes. The neckline feels firm and like it will stay in shape. To make my quilting cotton a bit firmer I also interfaced the entire midriff. This turned out to be a good decision. Although I have totally adequate ease in the midriff (nearly 2 inches), the midriff has arrows radiating from the side seam toward the center. When I lift up the neckline the arrows disappear, so I think they are due to the weight of the skirt on the midriff rather than the fit (good thing I didn't cut the front skirt in two pieces at the full width and make it even heavier!). I imagine it would look even worse without the interfacing. I'm not sure how to solve this problem in the future, except for just using lighter weight fabric so the skirt is not so heavy. Because I'm a little out of practice in sewing the Big 4, I wasn't sure how this would fit. 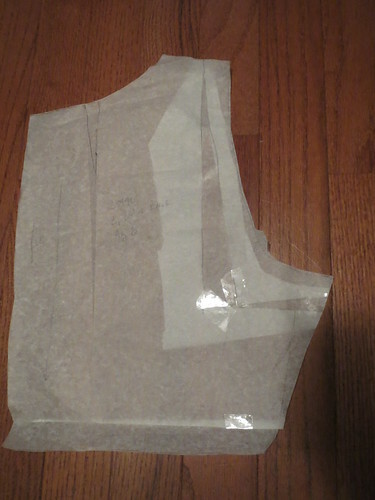 To give myself maximum possible adjustability, I assembled the front and back as separate units (the front and back bodice need to be separate anyway to do an all-machine clean-finish lining) so I could adjust along the side seam on the bodice, midriff, and skirt as needed. As it happens, apparently the sizing hasn't changed at Butterick, because it was perfect with the seam allowances as drafted (I cut an 8 at the shoulders/bust and a generous 10 at the waist). The final bodice fit is very good. The bust fits well (though it definitely has ease) and is flattering. I should have taken a tiny bit more length out of the front neckline, which sits away from the body a little bit. The neckline is also surprisingly low, lower than conveyed on the model I think. I might raise it up 1/2 inch next time. All in all, a fun sundress for our cool summer! I had a little fun with pulling out one of my hats for a vintage style look. With the width of the shoulder this would be easy enough to pop sleeves on for a Fall/Winter look, though I'd probably go with a less voluminous skirt rather than the wide pleated sundress look.